Hotel Tonight’s app is officially taking the giant leap across the pond. Starting Wednesday at noon local time, iOS(s AAPL) and Android(s GOOG) users can use the app for the first time to book a hotel room in London — just in time for next months’ Olympic Games. While the app is available for last-minute hotel bookings in 40 U.S. cities and recently expanded to Vancouver and Toronto, the debut in London is the young company’s first foray into the European travel market. The company signaled it had its eyes set on London after it announced the opening of an office there in April, and made its ambitions clear for all of Europe — and beyond — two weeks ago when it revealed a huge funding round of $23 million. In a phone interview from London on Tuesday, CEO Sam Shank told me why the city was first on his list when thinking of expansion to Europe. And that’s promising, he says, because New York City is one of the company’s most successful markets, along with San Francisco, Chicago and Boston. Hotel Tonight is also plunging into the growing London tech scene: its office — which currently is staffed by two people but will be expanding soon — is in the city’s tech hub in the Shoreditch neighborhood. The London office will act as the launchpad for the company’s eventual expansion to the European continent. That effort will be overseen by Heather Leisman, who was just hired as Hotel Tonight’s Managing Director for Europe. Leisman recently left Jetsetter, the struggling luxury travel deals subsidiary of Gilt Groupe, where she was head of supply and operations. “She’s just phenomenally well connected in the travel industry,” Shank says. 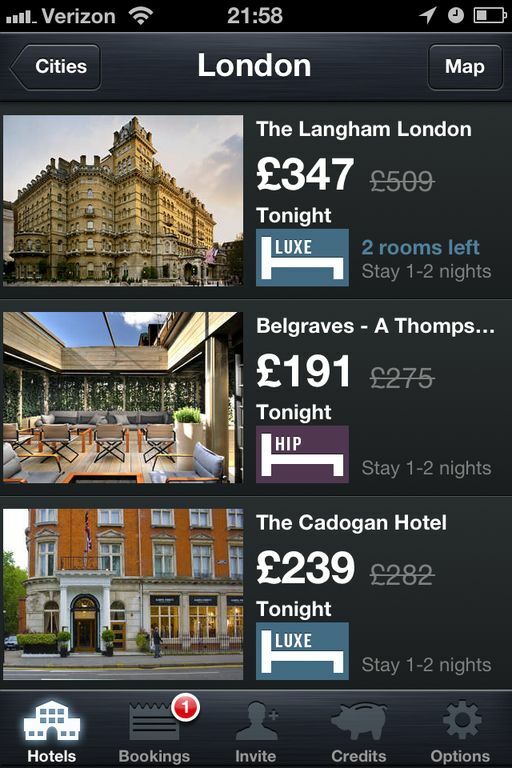 The list of London hotels available upon launch with Hotel Tonight’s app is small and carefully curated — which is the company’s m.o.. Like in other cities, the hotels were chosen based partly on reviews from consumer review sites like Yelp(s YELP) and Trip Advisor, as well as editorial reviews and competitors’ reviews. In London’s case, the selection of hotels is focused on hip, luxury lodging: Belgraves, Blakes Hotel London, St. Martins Lane London, The Langham and The Cadogan. Hotel Tonight is based in San Francisco and launched in early 2011. To date there have been 2 million downloads of its mobile apps. 2 million downloads of their app is certainly proving something and I think its innovation efforts and $23 million dollar investment should surely see a big growth in Europe, best of luck! Have to mention that VeryLastRoom app has been launched today too. What’s amazing is the realtime price drop into the app, you should see it to believe it !